Is there anything that screams comfort food more than a chicken pot pie? My favorite chicken pot pie is this one, but since we don't eat dairy/casein anymore I haven't had the time to revise the recipe to leave out butter. I remember in my old gluten-filled days I used to often make a chicken pot pie with a biscuit crust and I wondered if I could do the same with almond flour. I love almond flour because it is a high protein, low carbohydrate flour and it really works well in gluten free baking. So after getting a little inspiration from Elana's new book (which you MUST buy if you love baking with almond flour!) 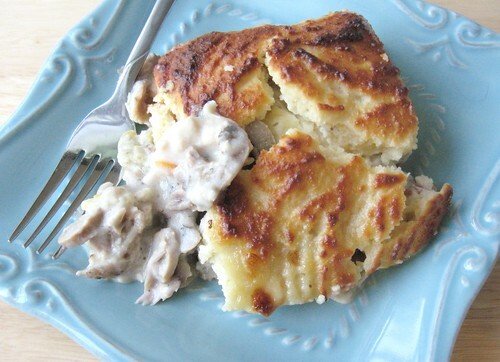 I created this recipe for chicken pot pie. Please don't let the long list of ingredients scare you away! This is really a very simple recipe to make and you can easily make the gluten free white sauce and the biscuit topping ahead of time if you need to! Whisk together almond flour, salt and baking powder in a large mixing bowl. In a smaller bowl mix together oil, sugar, eggs, hemp milk, and lemon juice. Mix wet ingredients with dry ingredients and set aside. The mixture should resemble a wet cake mix. Melt dripping from roasted chicken in a large saucepan. In a glass measuring cup whisk hemp milk and sweet rice flour together. Add to saucepan with chicken drippings or chicken broth. Add salt and pepper to taste and granulated chicken bouillon. Cook on medium heat for 5-10 minutes, whisking constantly until mixture is thick like a cream soup or gravy consistency. Preheat over to 350 degrees. Grease a large and deep 9x13" casserole dish. Place chicken in the bottom of the greased casserole dish. Pour mushrooms and vegetables evenly over chicken in the baking dish. 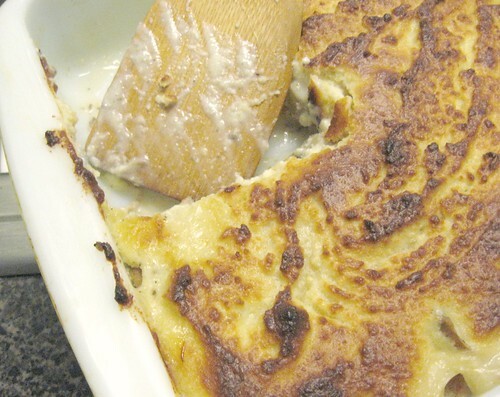 Pour prepared gluten free white sauce over the chicken and mix to combine throughout casserole. Finally spoon the "Buttermilk" biscuit topping over the casserole evenly. (I like to use a rubber spatula that has been rinsed with water to spread the biscuit topping over the casserole.) Bake the casserole for 25-30 minutes until biscuit topping is golden and crusty. You may need to set the oven on the "broil" setting for about 3 minutes to get a nice golden crust, just make sure to watch the time so you won't burn the casserole! Let cool for 5-10 minutes and serve with a simple green salad! The biscuit topping should be "wet" enough to easily spread over the casserole. The longer the topping sits, the more the almond flour will soak up the liquids. Feel free to add additional non-dairy milk or water until the batter will spread easily. I think the biscuit topping tastes almost like a "sourdough" topping on this pie! Almond flour is slightly sweet, so feel free to leave out the sugar called for in the biscuit topping. You can also use any type of non-dairy milk you like. Although I love the texture, taste, and feel of hemp milk! The White Sauce: I LOVE this gluten free/dairy free white sauce! This recipe is very versatile and you can add the flavors and seasonings of your choice. Hemp milk really is a wonderful choice in this sauce because it has such a mild flavor. Feel free to use other non-dairy types of milk, but I think the hemp milk gives the best overall flavor to the sauce. If you don't have a roasted chicken available, simply boil several chicken breasts and cut them up for the pie or use canned chicken! Wow, Carrie, that sounds so good. I miss eating chicken pot pies!! I'm passing on a blog award to you, you can redeem it on my site. Thanks for all the good home-cooking recipes! I just made fabulous chicken pot pie - the biscuits were divine. My husband was so happy - pot pies are not something that I'd normally cook but for my husband I'll do anything. Carrie - this looks like a winner to me. I am printing this and putting it in my "must-try-comfort-recipes" file. Thank you! I know you're inspiring to your readers. This looks fab! This looks so delicious. It does look like a bit of work but so worth it. I am looking forward to fall too! I love this! I love to see how you substitute the traditional AP flour for other flours! I am not gluten-free but I am trying to learn how to cook with other types of flours because I think AP is not tasteful at all. Is it weird if I think that's not a long list of ingredients? LOL I guess I'm just used to the gluten-free recipes out there - they're ALL long! This sounds delicious!